Well done to former Park Fc player Shane McLoughlin who made the Ipswich Town Fc Match Day Squad for Saturdays 3rd round FA Cup tie against Lincoln City . The game finished 2-2 so hopefully Shane might see some playing time in the replay in a few weeks time . Current Park Fc payer Sean McGrath has been named on the stand-by list for the Irish U15 squad for their upcoming games against The Netherlands . Well done Sean and everyone at the club is hopeful that you will get called up to the squad . Killarney Athletic 8 – 1 Park B . Park B 5 – 4 Killorglin B . Park 2 – 4 Fenit Samphires . 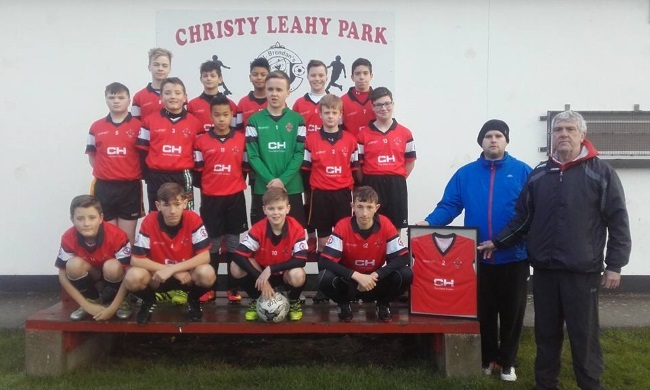 St Brendans Park Fc U14B squad with their new kit kindly sponsored by CH CHEMIST, Tralee on Saturday. It was a foggy damp morning for the game between Park B under 14 and Killorglin, conditions were very slippery. The game got under way at 10.40 with both teams going at it, 5 minutes in a corner from Park created a scramble in the Killorglin goal mouth and saw the ball go in off Niall Heaton to make it 1-0. Shortly after a good move by Killorglin saw them equalise.Half way through the half a Killorglin player going down in the box resulted in a penalty and Killorglin took the lead. Minutes later Park were caught out at the back and Killorglin went in 3-1 up at half time. Park made two changes at half time and came out a different team, dominating play. Five minutes in a lovely shot by Danny Fisher scored Parks second. This inspired the team on and within another 10 minutes Matt Healy levelled the teams. Park were still on fire and when a long ball was played forward Leonit Salihaj took it and ran at the defence and stuck the ball in the net, 4-3 to Park. Against the run of play Killorglin got a break and scored an equaliser. Seven minutes to go and another through ball saw Leonit pick it up , round the defence and blaze it past the keeper. Final score, 5-4. There were some excellent performances by all park players and it was impossible to pick a man of the match. Performances that merit a mention were by keeper Hugh Emmerson who was outstanding in goal, Leonit who scored two and just missed two more. James Charles was solid in defence. Well done to everyone, it was a good team effort which showed spirit to come back from 3-1 down to win . 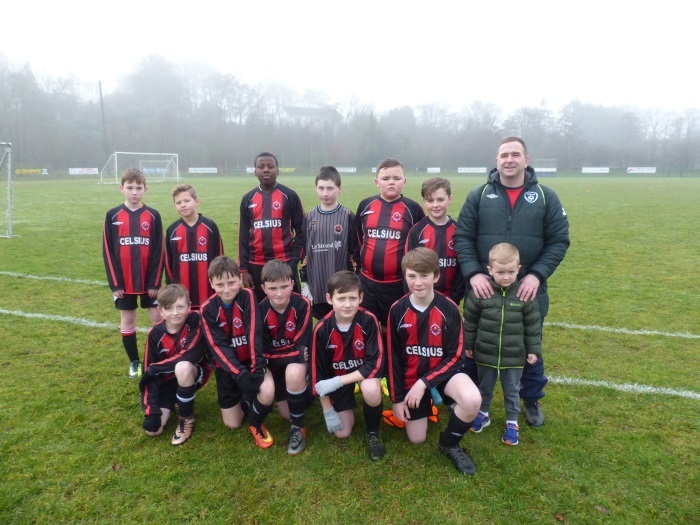 The U12B side went down on Saturday away against a very strong Killarney Athletic A team . This squad are showing great improvement every week and we probably wont come up against a stronger side in the division this year . Josh O’Connell scored our only goal with Sean Moynihan playing very well in goals . Park FC U12B squad before they faced Killarney Athletic on Saturday. Camp Juniors v Park A , 7-00pm TBC , Venue Mounthawk Park All Weather Pitch . Killarney Celtic v Park A , 7-15pm . Mastergeeha (2 teams) v Park FC (2 teams) , 2-00pm . Park FC (1 team) v Tralee Dynamos (1 team) , 2-00pm . Park A v Tralee Dynamos , 10-30am . Killarney Athletic A v Park B , 12-30pm . LB Rovers v Park C , 12-30pm . Park A v Tralee Dynamos , 11-30am , Venue Mounthawk Park All Weather Pitch . Park B v Ballyhar Dynamos , 12-00pm . Park C v Killarney Celtic B , 10-30am . Check our club website daily for fixture changes and updates.